Show your gratitude. Little gifts are often the best. 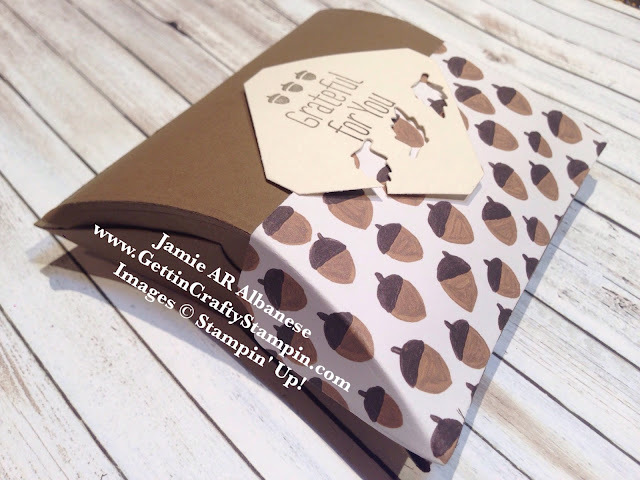 Here is a fun way to create a quick, cute and seasonal gift wrap that we can ALL use!! Creating little gifts for our teachers this year, it's great to show how they can fit in this stylish gift box. I love easy and fun hand-stamped gifts and cards. Join Us in creating and delivering smiles, wrapped up in paper crafting. It's (almost) Fall, y'all! This cute BUNDLE is perfect as it (A) is so easy and cute to use (B) Creates the perfect sized gift box for gifts, gift cards and more and (C) Saves me 15% more on my already juicy discount (you can save 15% or 35% or more when you JOIN MY TEAM). Die-Cutting this cute Square Pillow Box Thinlits on the Big Shot Die-Cutting Machine and Magnetic Platform is easy. I did it twice on the Soft Suede card stock and once on this Into the Woods Designer Series Paper. Cut the Into the Woods Designer Series Paper in half, long ways. Adhere the cut half to one of the Soft Suede card stock pieces with Fast Fuse Adhesive (a super strong tape like dispenser that we sell and that I LOVE!). 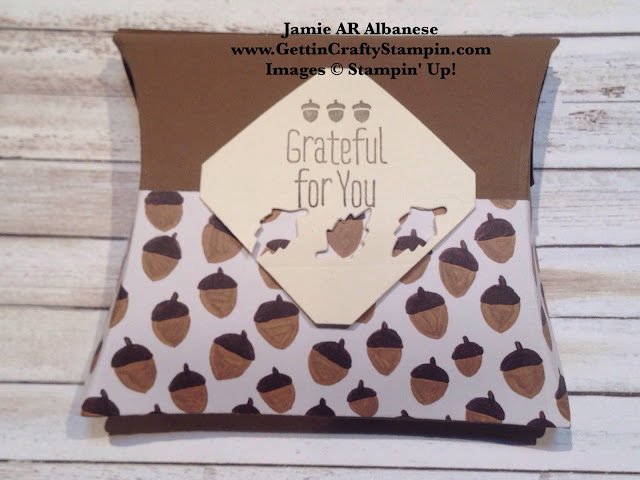 Create this cute tag using the coordinating A Little Something stamp set in Soft Suede ink. Die Cut and add these adorable leaves with the Square Pillow Box Thinlit Dies for an easy and pretty hand-crafted gift. I love wrapping a gift in something pretty. This is like a gift in a gift. Something pretty makes it fun to give the gift from the moment they see it! Here is a sweet, easy and fun gift wrap that is perfect for Gift Cards, Jewelry, Scarves, Oils Candies, Cookies, Treats and more. 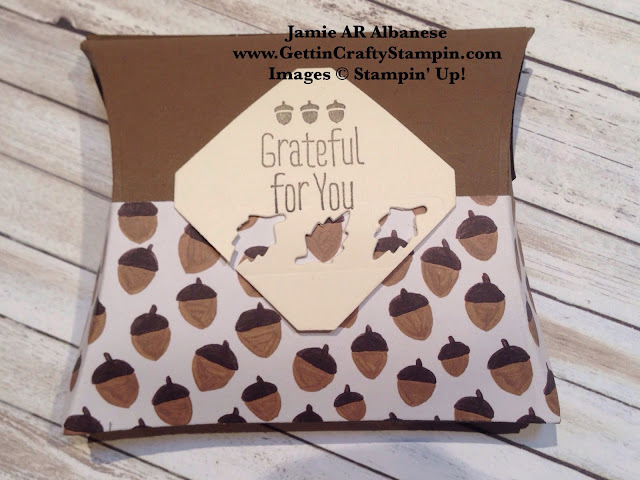 Join Me in making the world a little prettier with pretty hand-stamped paper crafts. I love how it saves my budget while looking dynamic. Who would YOU give this gift to? This works perfectly for other business owners, like Shelley, who give gifts and wrap their sales in pretty boxes, too.